This watch with classic luxury retro design will give you an extraordinary artistic beauty. Hollow out design wristwatch, show your charming personality, make you become a highlight in the crowd. With this watch in your hand, no need to worried about late problem anymore. You can watch it anytime and anywhere. Hollow out design wristwatch, show your charming personality, make you become a highlight in the crowd. Four types optional, modelling delicate contracted design style, with mastery and contracted lines, generous and dignified. Luminated needle is convenient for you to use at night. 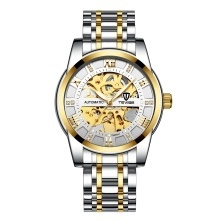 Classic and fashion skeleton dial design, exquisite workmanship keeps the time accurate. Stainless steel material provides you comfortable wearing experience. Metal outershell, strong wear and abrasion resistance, anti-scraping, corrosiveness resistance, soild and practical. Fine steel belt, use electroplating process, anti-fading and exuding texture luster. 30m waterproof, suitable for daily use, even can be used in the rain. With this watch in your hand, no need to worried about late problem anymore.